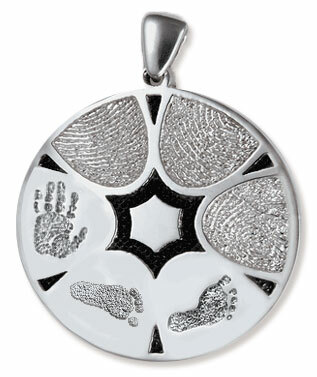 Created from actual fingerprints, handprints, or footprints! 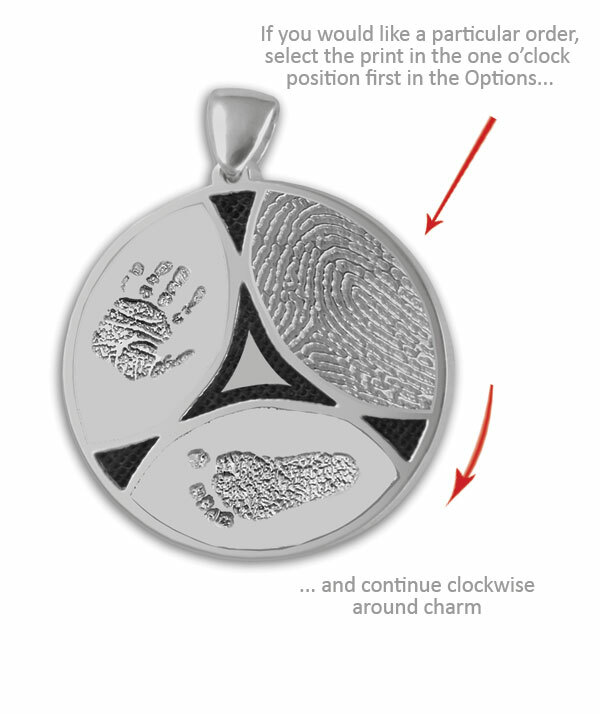 Run your finger across the surface of this sterling silver Thumbies memorial keepsake pendant/charm and feel a spiritual connection to your loved one. 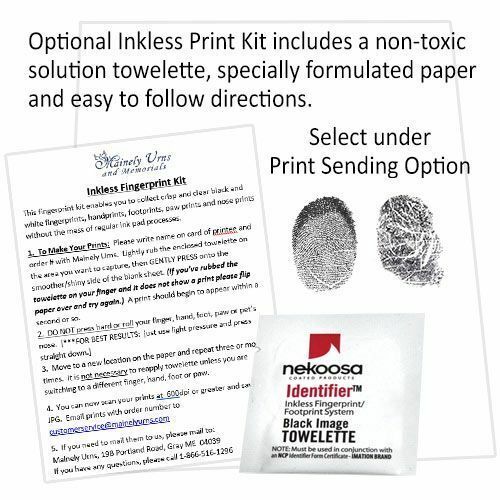 The clearly defined detailed surface of the raised or embedded print is from their actual print. An instant family heirloom to be passed from generation to generation. Each Thumbies is a custom piece of art. 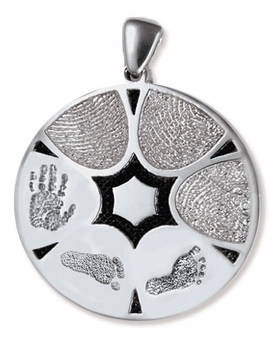 Three-dimensional Thumbies are crafted from simple ink fingerprints, footprints, or handprints using the ancient art of lost-wax casting. 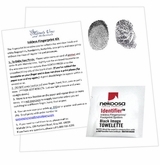 A 3D imaging program is used to help create a wax mold of the fingerprint, handprint, or footprint from a scanned ink print. 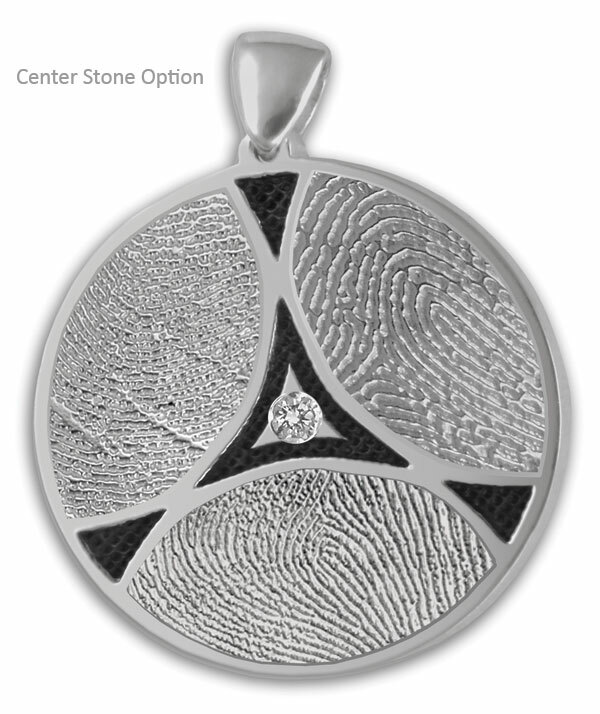 Our artisans select the area of fingerprints that carry the most definition and meticulously sculpt the print to perfectly mimic the original. Add a matching chain in sterling silver, 14k white or 14kyellow gold. 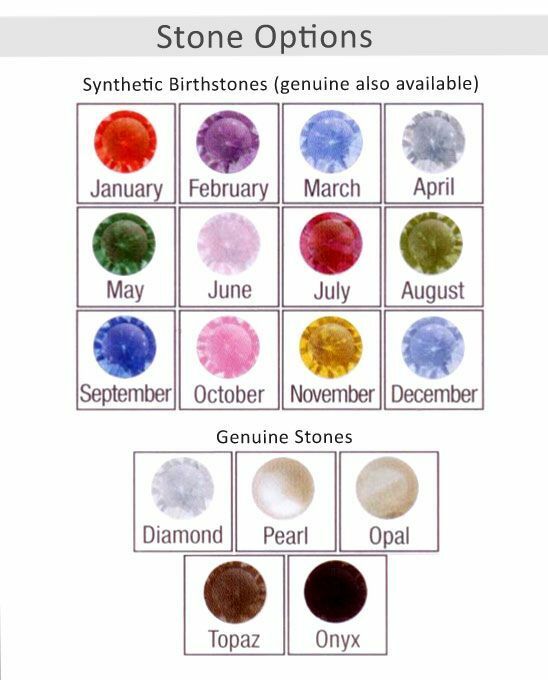 Add one or two synthetic birthstones. (genuine birthstones are also available - please call for prices - 866.516.1296). Synthetic stones, as well as some genuine stones, are pictured in the inset above. Need a matching Charm Bracelet? Click here for details. 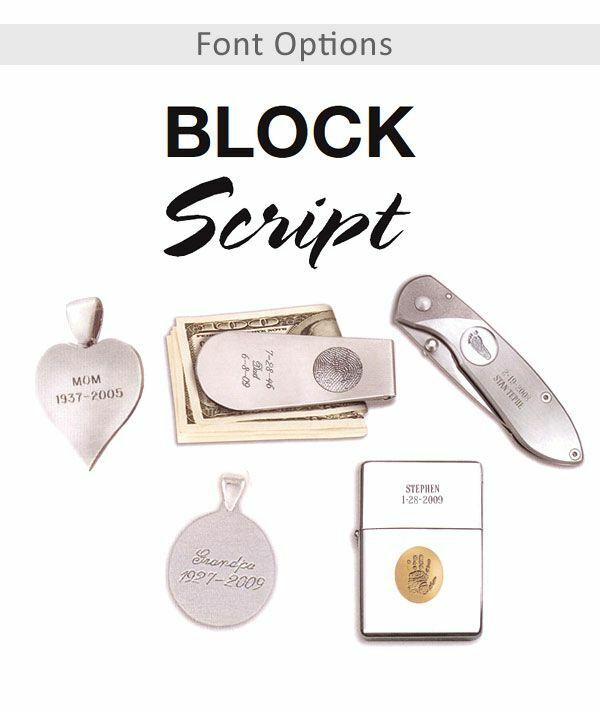 Can be engraved with three lines of text with up to 12 characters and spaces per line. Any charm can be made into a pendant with the purchase of a chain. Box chains are available in sterling silver and Anchor chains are used for both 14k yellow and 14k white gold. Extra length chains of 20", 24" and 30" are available in all three metals. 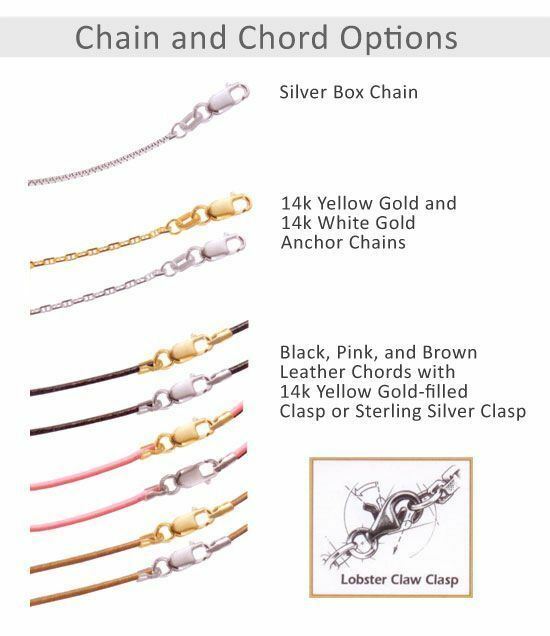 Sturdy lobster claw clasps are used on all chains, cords, and bracelets. Leather cords give a youthful look when combined with your favorite charm. Sturdy lobster claw clasps are used on all chains, cords, and bracelets. 18"
Production of cast print pieces (Thumbies/Buddies) can take up to 3 weeks after step 1 and 2 above. Sterling Silver will tarnish, it is a natural process of this metal. Remove all the residue from the jewelry with a liquid Tarn-X on a soft tissue. 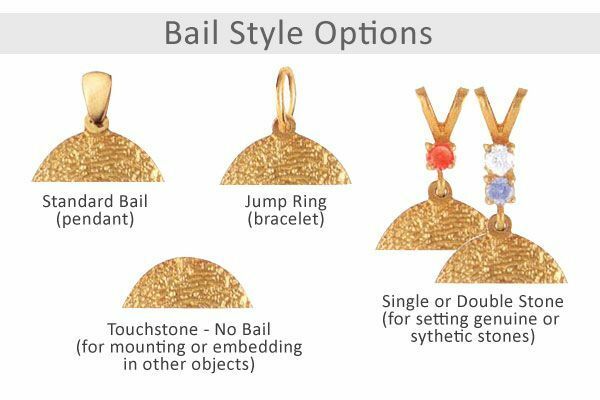 Do not submerge any jewelry with stones (synthetic or genuine) in liquid Tarn-X or leave any jewelry in the liquid for any longer than a few seconds. Use a silver cream polish, such as Flitz, on a paper towel to remove excess black and tarnish from the jewelry. 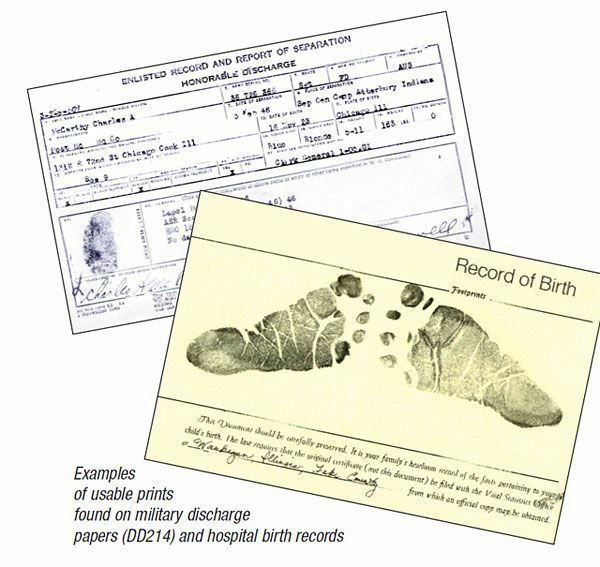 This process may need to be repeated several times. Finally, using a soft cloth towel or jeweler�s rouge cloth, polish the jewelry to restore it to its original luster.